If your brand has already dipped its toes into the content marketing waters, you know how important it is to occupy a prime thought leadership position in your business niche. With options like blog posts, videos, infographics — and a vibrant social media presence to drive customers to them all — your content marketing strategy should aim to establish your expertise, solidify your core branding, and spread the word about what you do. The problem is, achieving those goals requires a lot of content, and it can be difficult for customers to find all the great content you’ve created if you are simply adding it to your blog and moving on. I’ve harped on this a lot over the years, but when you become a content marketer, you are essentially becoming your own publication. Of course, this means developing a rich and highly organized editorial calendar and employing a top-notch creative team to implement your plans, but it also means organizing and displaying that content in an intuitive, visually compelling manner that’s as well thought out as the articles on any professional media site. In short, you’ve got to create a content marketing resource center. Wait, what’s a resource center? Essentially, a resource center is a site within a site, where all of your content is organized. The necessity of having one has only arisen relatively recently with the evolution of content marketing from a single effort here and there to a constant supply of blog posts, videos, podcasts, eBooks, SlideShares, and more. Without a resource center, all of this wonderful content can become buried on a blog’s archives or get dispersed across several sections of a company’s site. This makes it very difficult for consumers to find, and it essentially means that a piece of content’s usefulness will continually decline as it ages, as it simply won’t be findable over the long term. Focusing your topic: Often, I see businesses fall into the trap of trying to provide every kind of content to everyone or, alternately, interpreting their subject area far too literally. As we’ll see in the examples below, a good content marketing plan focuses on a concrete core from which all other content spokes can emerge. A resource center provides the visual organization that highlights the connections between these spokes. Catering to different audiences: Many businesses often appeal to several different audiences at once. A resource center can help create the space to tailor how your content approaches each audience to its unique needs and interests. You might, for instance, divide your content by varied subject areas, create separate sections that directly reference each kind of audience, or create sections for the different content genres (i.e., infographics, white papers, etc.) that work best for a particular audience. Encouraging content discovery: If a resource center can successfully bring consumers to your content, it’s even better at helping them get to the second or third piece. Once they’re finished absorbing the expertise of your initial piece, the resource center makes it easier for consumers to find — and click on — additional pieces of related content. This helps your content provide them with greater value. By contrast, this kind of natural discovery is next to impossible with a single-page blog, no matter how vigilant you are about tagging and categorizing. Building content on content: With a strategically developed resource center, it’s much easier to take a single topic and run with it across content types. You might, for example, start with a simple how-to article, and then add to it an instructional YouTube video and an infographic, all of which you can then organize to live on a relevant section of your website. Moreover, this can be done all at once or over a longer period of time as part of an ongoing email or social media content campaign. You can also revisit your resource center section and repurpose the content to speak to current events or to new tech developments as they emerge. In short, a resource center allows for a much more integrated content marketing strategy — one that allows you to augment your content creation efforts in creative ways. Promoting more vibrant linking: All of this organization means much more intuitive navigation for your users, which makes them far more likely to link both to the resource center as a whole and to individual pieces. What’s more, it also makes content much easier for you to find, so you can link to or embed any of these pieces as you create further content that refers to the topic at hand down the road. To gain a deeper sense of just what a resource center is, what potential forms it can take, and what it can help you accomplish, let’s examine three brands that have successfully leveraged this technique as a centerpiece of their content marketing strategy. Tires are among the more important products we interact with on a daily basis, yet to most of us, they remain a mystery. How do I know when they should be replaced? When do they need to be inflated, and how much air do they need? How can I get better performance out of them? The list of questions we can ask goes on and on. Naturally, the tire company Bridgestone is chock full of expertise on the subject and is primed to answer our questions. However, tires aren’t exactly a scintillating topic of discussion — and even motivated, in-market readers might quickly become overwhelmed if they tried to absorb a large volume of information that was just deposited onto a blog. Features: This section highlights the most popular recent articles on the site. A section like this is a great way to curate your content and bring your most pressing content campaigns to the forefront. Driver’s Ed: This is the more how-to section of the site. In addition to car maintenance tips and guides, it also offers expert explanations of car questions users likely have but have never asked about. Let’s Ride: This section of the site is all about tires and cars in action. While it does offer more tips, like driving tips for teenagers, it also offers broader guides, like one on the best driving roads in the world. 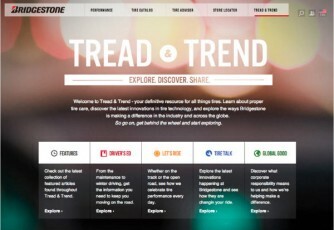 Tire Talk: This is really where the company’s branding comes into play, featuring articles that break down the latest Bridgestone innovations as well as guides to better tire maintenance. Global Good: This last section is another excellent one for branding, focusing on the company’s green initiatives. This is a great example of a kind of content that would be difficult to integrate naturally and consistently on a single-page blog. Right out of the gate this is much more visually compelling and intuitive than your run-of-the-mill blog, as it separates sections of the resource center with great photos in a very Pinterest-like manner. Once users clicks on a section, they can further narrow down the displayed content by choosing subcategories that are most applicable to their current areas of interest, like maintenance tips or safety information. In this way, they can navigate easily to the highly specific content they’re looking for. In some cases, this navigation is evergreen: Tire Pressure, for instance, is a subcategory that’s relevant all year round. Other subcategories, like Winter and Seasonal are a little less so, and yet they’re just as easy to find and share. Photos are also used throughout all of the content, which makes for a very engaging and clickable experience. Importantly, each post links to other posts throughout the resource center. This linking, combined with the intuitive subcategories, helps customers not only find what they’re looking for, but also to stumble across information they didn’t even know they needed. It also unites diverse content with varied purposes into one logical platform, which can help keep your visitors on your site for much longer than a single piece of content could. Tips and takeaways: A resource center starts with intuitive categorization and organization. If you’ve already produced a ton of content at this point, take the time to do a content inventory so you can determine what categories might be relevant. 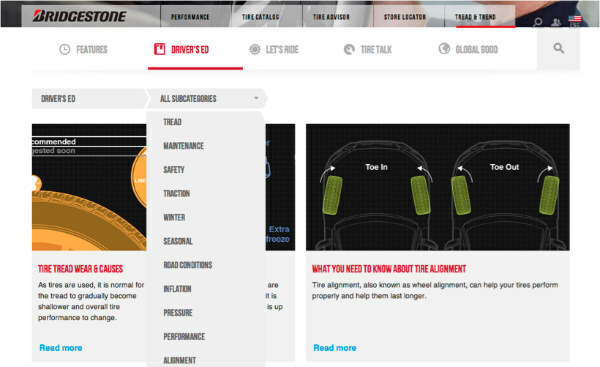 Then, as you add these content pieces to your site and build out a full resource center, make sure to emphasize it through the strategic use of relevant visuals, as Bridgestone does in the example above. The more navigating visitors can do just by clicking on a photo they like, the better. And of course, make sure to link to more of your brand content wherever there’s a relevant connection. Bridgestone’s resource center is a great example of a leading company with important expert knowledge to share — the kind of knowledge that naturally fills out an editorial calendar with minimal effort. However, for a brand like Concert Hotels, which provides rooms near concert venues, there’s a limit to how much value a how-to blog or other expertise-driven content can provide. But what it can do is create content that appeals to its very unique niche: music lovers — specifically, those who are passionate enough about the music they love that they’re willing to travel to concerts where they’ll need to stay in a hotel room. And that’s exactly the technique Concert Hotels has taken with its resource center, which features a number of fun, interactive tools that are highly reminiscent of the same debates and discussions you’ll find music lovers having in venues the world over. For example, one content resource Concert Hotels offers is a tool that lets users make their own dance music collaborations, choosing who to remix and giving them a ton of options to do so. In another, users are presented with minimal visual cues and prompted to guess which famous artist and song they depict. This is exactly the kind of content that visitors will organically share, and it does an excellent job of communicating the brand’s tone and unique approach. These content pieces demonstrate how well the brand really “gets” its audience. In turn, that audience becomes more motivated to support Concert Hotels by driving traffic to its site, sharing its content, and booking its rooms again and again. So, what does putting this into a resource center do for the brand? For one thing, it makes each piece that much more discoverable. 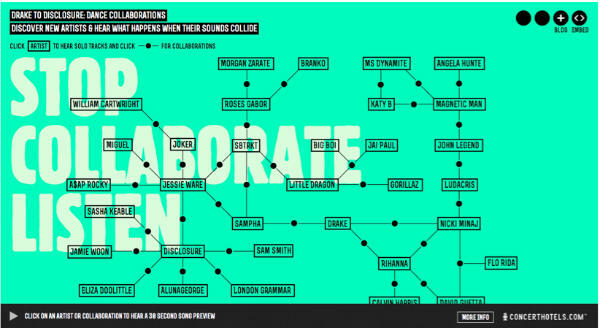 Users may come to the site to give music collaboration a whirl, but they’ll find themselves having so much fun, they won’t be able to help clicking around the main page to find more interactive tools. Each piece forms the core of a content marketing campaign that can be shared over email and social media, while links to the resource center itself can be slipped into the company’s more traditional promotional campaigns. 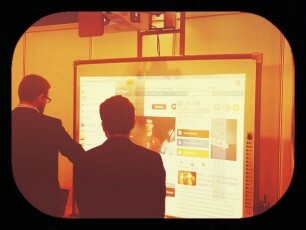 Though each interactive piece may be different, they are all highly relevant to the company’s music focus and branding. Through a resource center, they can function, collectively, to help establish the company’s expertise and demonstrate its understanding of its customers’ interests and needs. In short, the resource center becomes the heart of a well-integrated social media, email, and content marketing strategy. Tips and takeaways: Whether you’ve got a wealth of expert knowledge to share a la Bridgestone or you’d prefer to create an interactive area where visitors will linger, take some time to get to know your audience before you do anything else. Think about why they would need your services, as well as the peripheral needs and interests connected to that core. 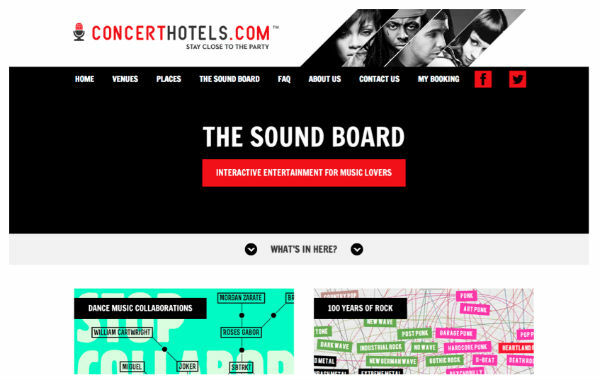 Concert Hotels isn’t just creating content around its business of providing a place for concert-goers to sleep; its content marketing strategy revolves around its brand playing an important part in creating a richer concert-going experience. The content in its resource center reflects this by playing to what music aficionados care about and bond with one another on. In theory, Red Bull faces a similar challenge as Concert Hotels: It can’t exactly build a robust, shareable resource center out of articles like, Top 10 Reasons Why Energy Drinks Are Pretty Cool or, Hack Your Life for Awesome With the World’s Best Energy Drink. No biggie. Without a direct how-to link for its product, Red Bull turned to its target audience for inspiration — an audience that is relatively young and enjoys extreme sports, as it turns out. With that knowledge in hand, over the years Red Bull has transformed itself into a leading authority on extreme sports — and an important promoter of those sports, as the company often sponsors and organizes its own events. 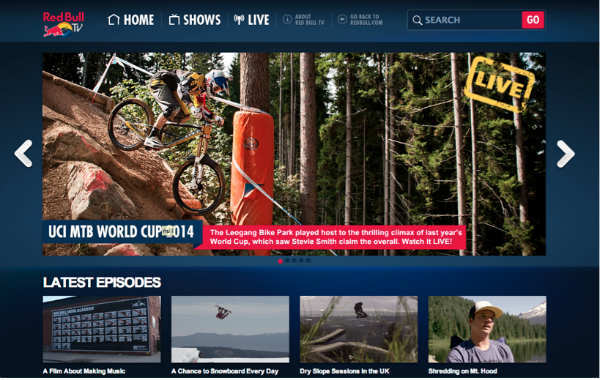 Red Bull TV, which is essentially the brand’s resource center, is a platform for demonstrations of this spectacular content marketing expertise. For example, the sporting events themselves are live-streamed on Red Bull TV, and there is a steady drip of new shows that cover virtually every area of extreme sports a fan can think of. Of course, the success of Red Bull TV hinges on the fact that audiences are instantly engaged as they watch people push themselves to the limit. Therefore, this content is inherently shareable, and can be easily promoted across the brand’s many social media and wider marketing channels. As such, it makes for an ideal content hub. However, with so much content to share, the key here again is in the resource center’s organization. Across the top, you’ll see subcategories for a number of different kinds of extreme sports, including, Motorsports, Biking, and Surfing. There is also a subcategory for Athletes and Music. Once you click on any one of these categories, a number of videos appear, each with compelling screenshots, titles, and descriptions, which combine to make each link inherently clickable. As such, it would be difficult for any visitors not to find themselves navigating deeply into the site, let alone a visitor with an intrinsic interest in the subject area. This organization also makes it easy for aficionados to become experts in their chosen sub-subcategory by clicking on tags like BMX or digging more deeply into an athlete highlight. Essentially, it is a comprehensive, go-to resource that makes navigating to any other extreme sports sites unnecessary. That’s great for the audience — and it’s even better for the brand. Tips and takeaways: Remember what I said about needing to be your own publishing company? Sometimes, you need to be your own media channel — especially when your audience’s peripheral interests relate to something spectacular and unique. Whatever medium you choose, try adopting a documentarian’s attitude to content creation. Reach out to industry leaders for interviews, capture big events on film, and curate pro videos. Then put it all together in a visually compelling and well-organized platform so you can both dominant this emerging genre and promote intuitive customer discovery. When it comes to managing and promoting the dynamic, rich, and massive content marketing strategies that successful businesses must create today, a resource center is essential. It simply can’t be beat in terms of linking, organization, and sharing. The real question is, when will you start building your own? Looking for more guidance on creating great audience resources through content marketing? You won’t want to miss Content Marketing World 2014, September 8–11, 2014. Register today!